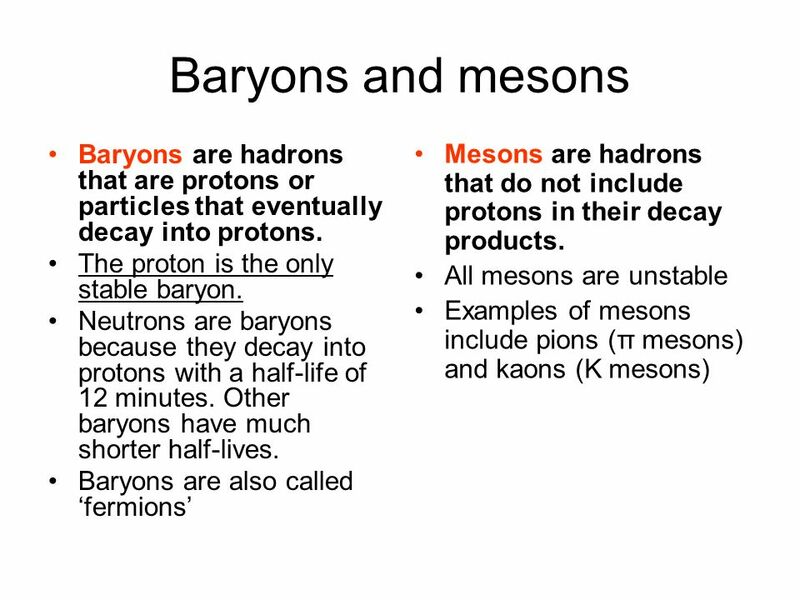 Hadrons: baryons (proton, neutron) and antibaryons (antiproton and antineutron) and mesons (pion, kaon). Hadrons are subject to the strong nuclear force. Candidates should know that the proton is the only stable baryon into which other baryons eventually decay; in particular, the decay of the neutron should be known. 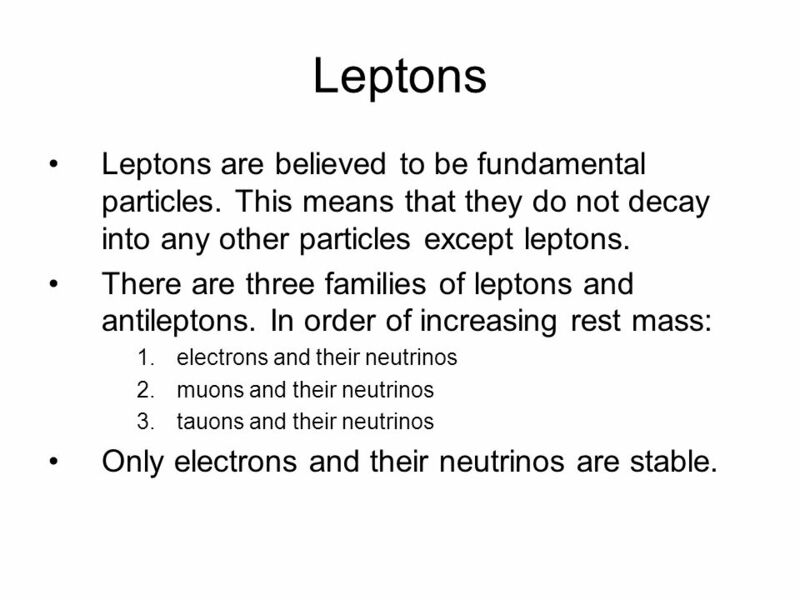 Leptons: electron, muon, neutrino (electron and muon types). 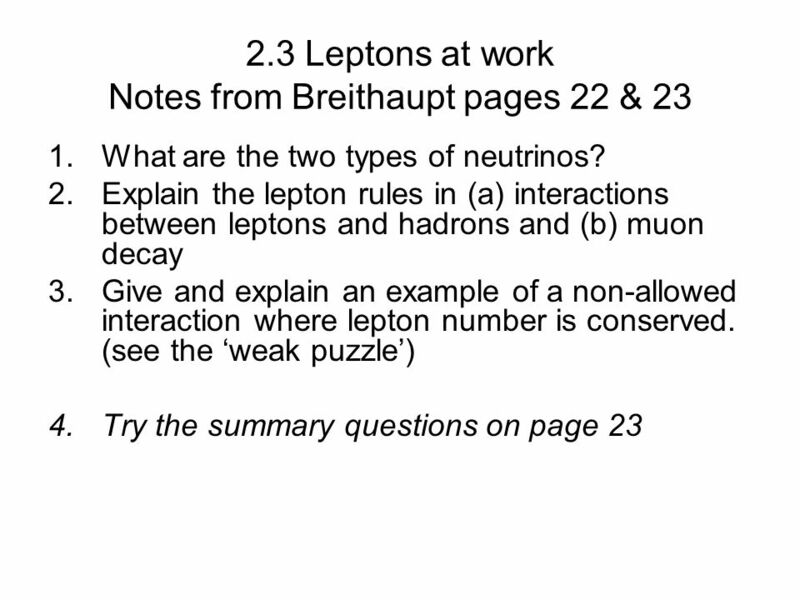 Leptons are subject to the weak interaction. Candidates will be expected to know baryon numbers for the hadrons. 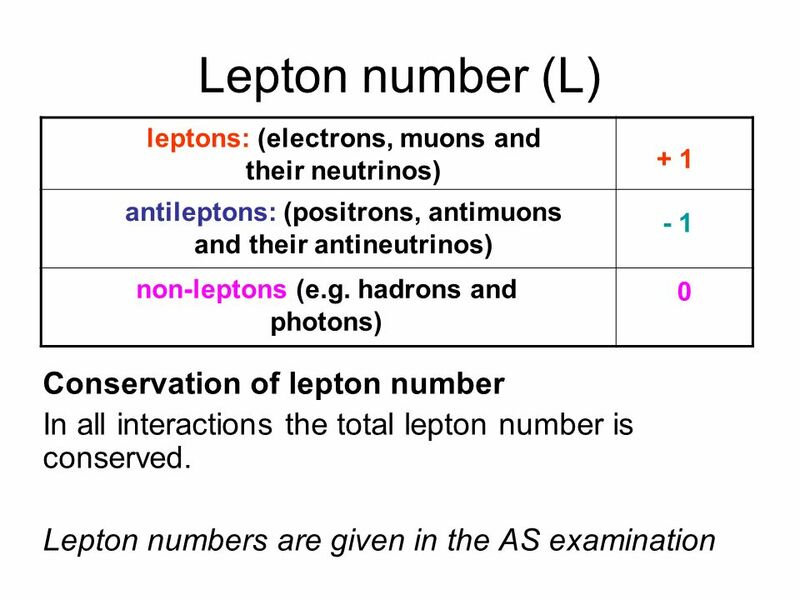 Lepton numbers for the leptons will be given in the data booklet. 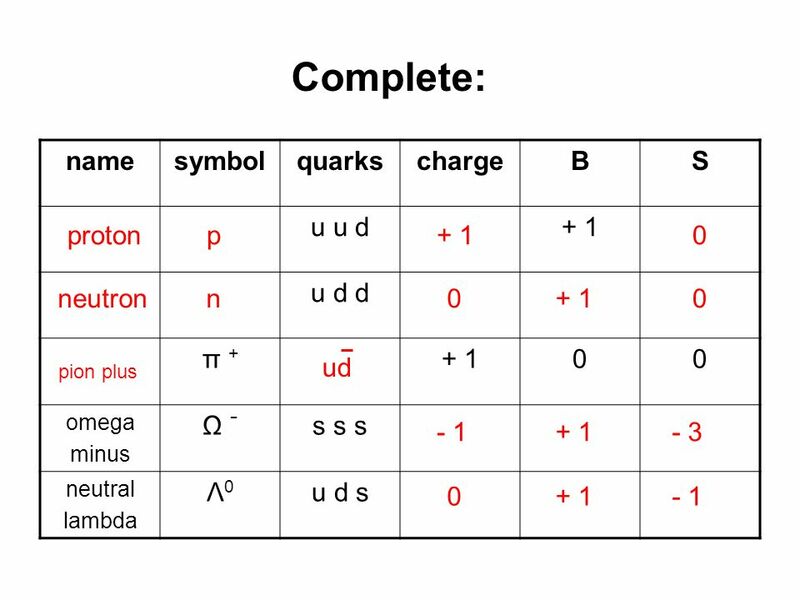 3 to 5 Quarks and antiquarks Up (u), down (d) and strange (s) quarks only. 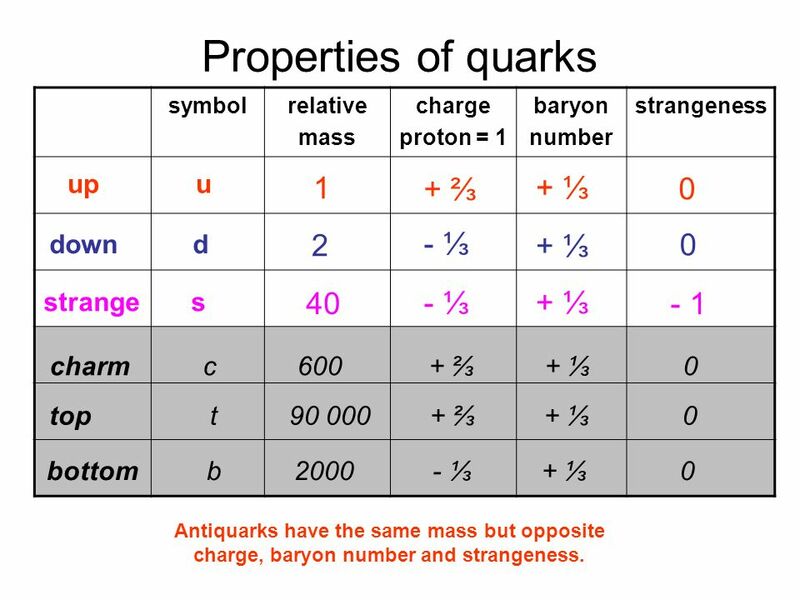 Properties of quarks: charge, baryon number and strangeness. 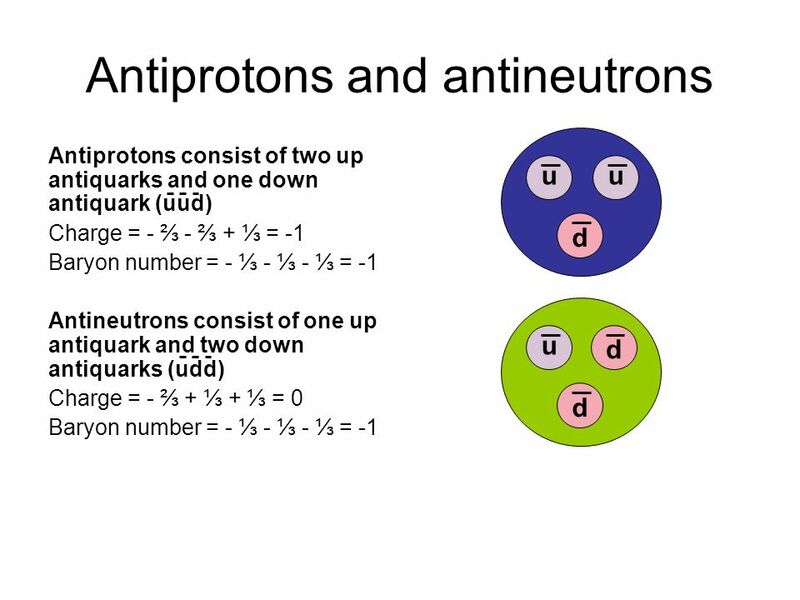 Combinations of quarks and antiquarks required for baryons (proton and neutron only), antibaryons (antiproton and antineutron only) and mesons (pion and kaon) only. 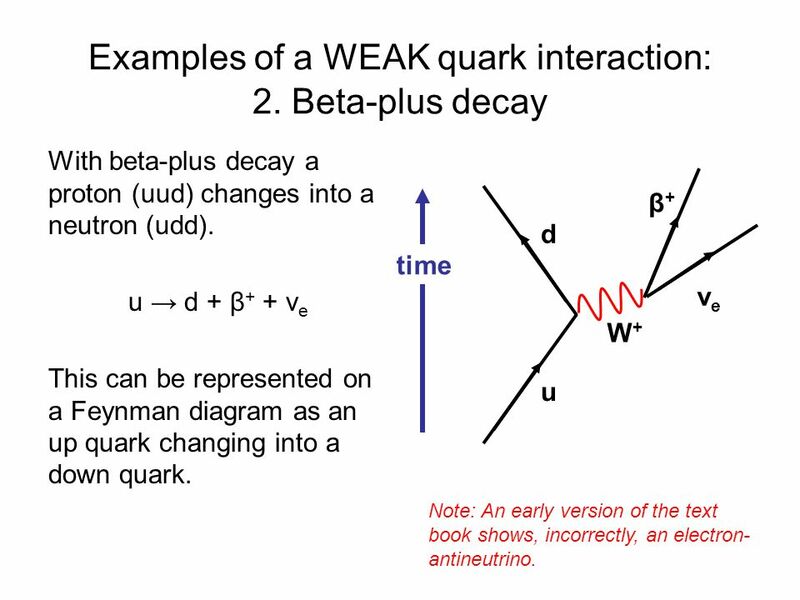 Change of quark character in β - and β + decay. Application of the conservation laws for charge, baryon number, lepton number and strangeness to particle interactions. 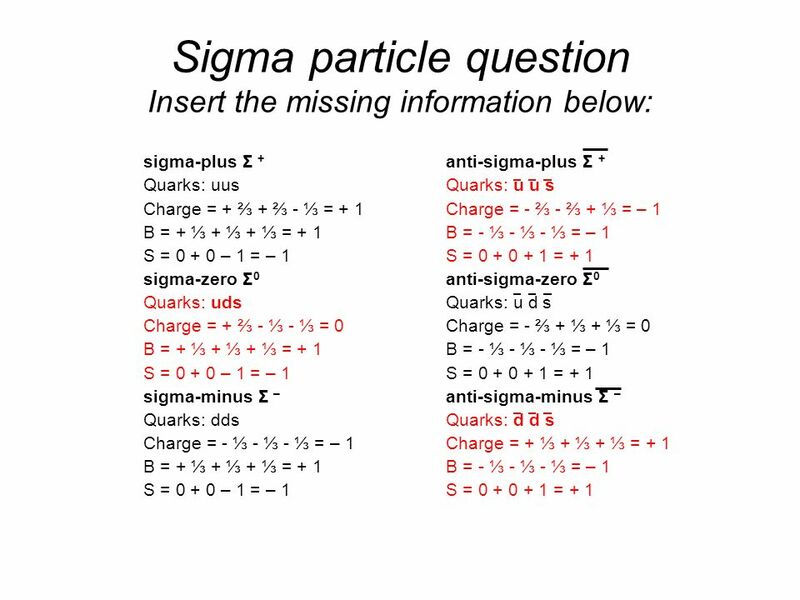 The necessary data will be provided in questions for particles outside those specified. 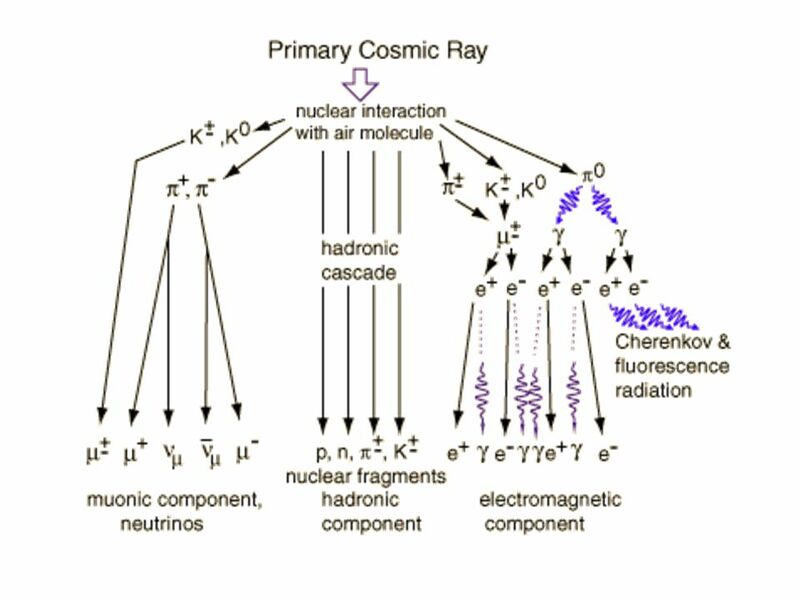 Cosmic rays consist of high energy protons and nuclei emitted from stars including the Sun. 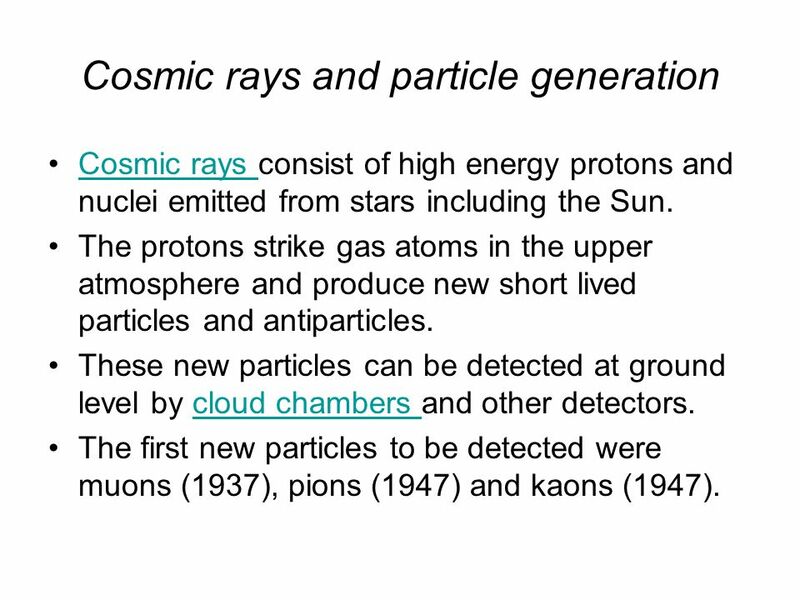 The protons strike gas atoms in the upper atmosphere and produce new short lived particles and antiparticles. These new particles can be detected at ground level by cloud chambers and other detectors. The first new particles to be detected were muons (1937), pions (1947) and kaons (1947). 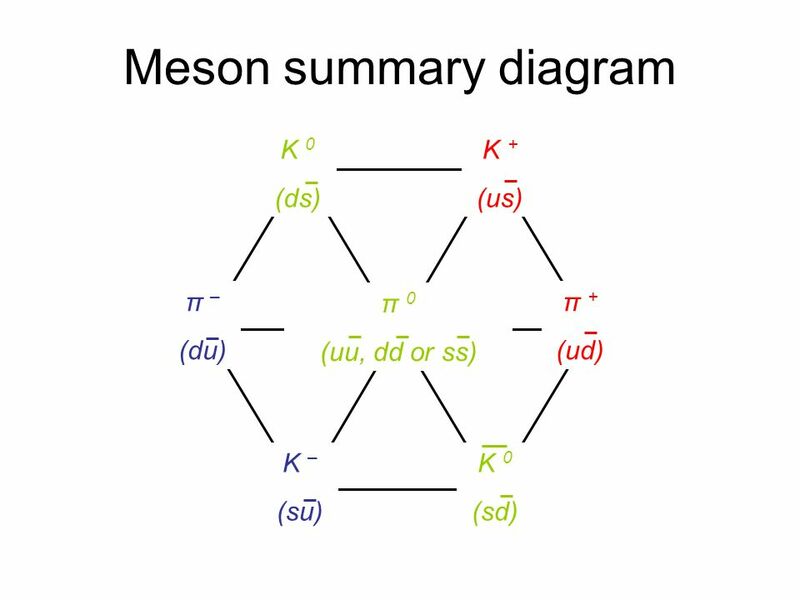 10 Kaons or K mesons Kaons or K mesons can be positively charged (K+), negatively charged (K- ) or uncharged (K0). 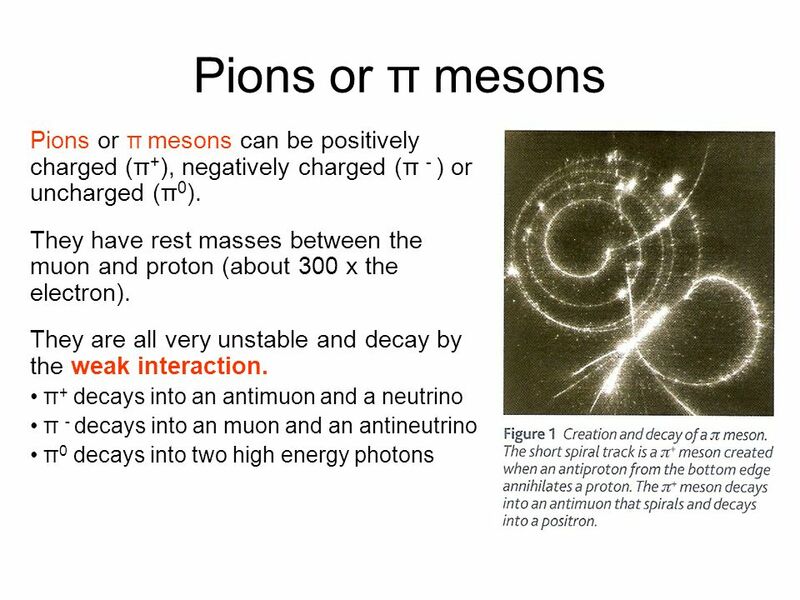 They have rest masses greater than pions but less than a proton (about 1000 x the electron). They are all unstable and decay by the weak interaction far more slowly than pions. This relatively slow rate of decay (about s) was unexpected and led to these particles being called ‘strange’ particles. 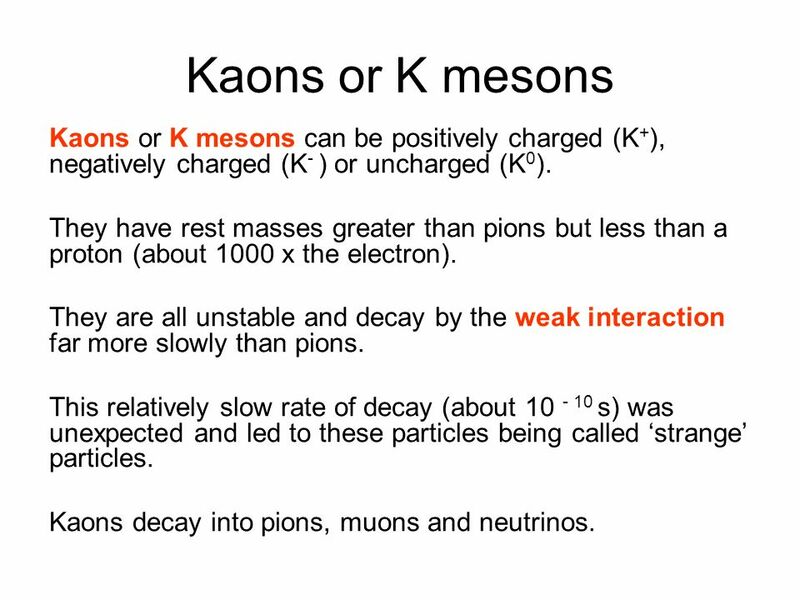 Kaons decay into pions, muons and neutrinos. 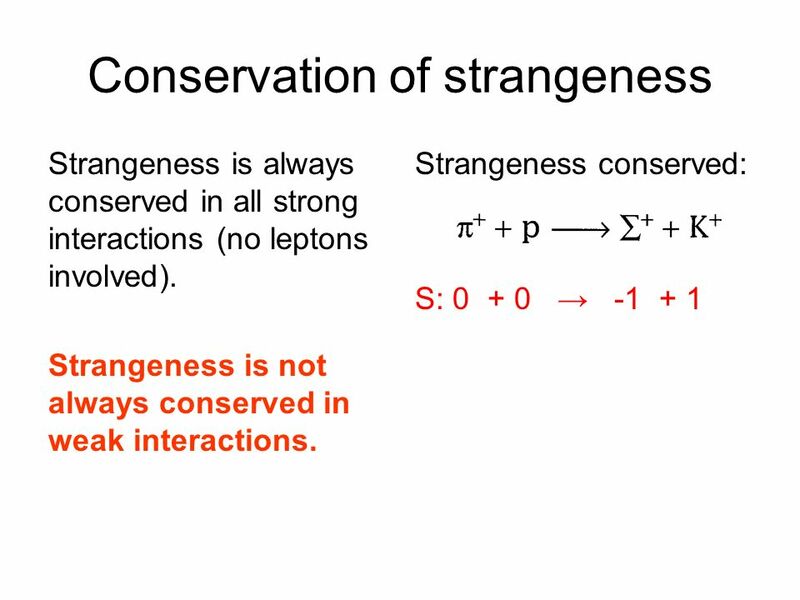 11 Strangeness This is a property possessed by some hadrons that has been assigned in order to explain why some particle interactions take place more slowly than others or do not occur at all. 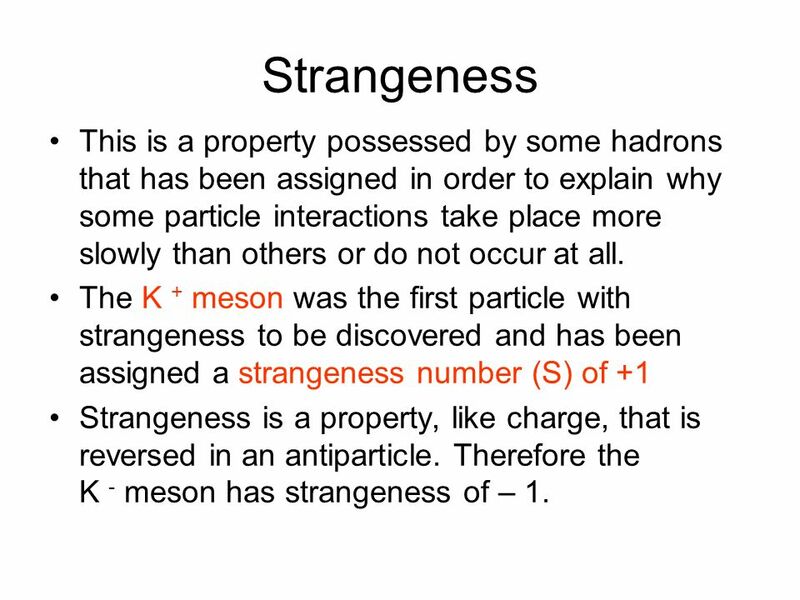 The K + meson was the first particle with strangeness to be discovered and has been assigned a strangeness number (S) of +1 Strangeness is a property, like charge, that is reversed in an antiparticle. 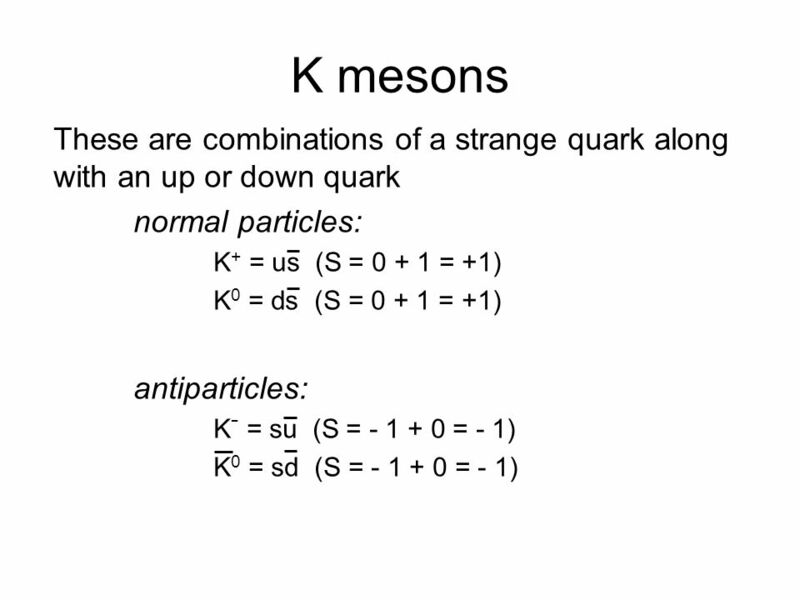 Therefore the K - meson has strangeness of – 1. 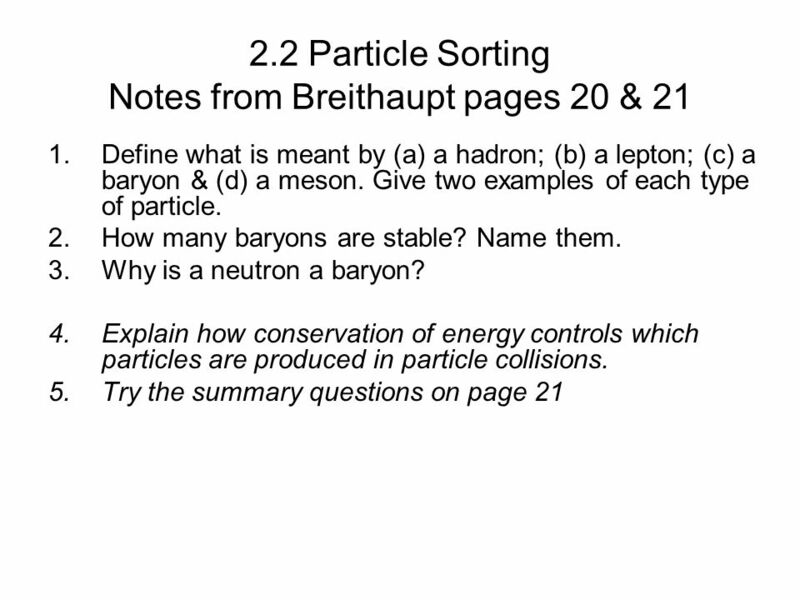 12 Baryon number (B) baryons: (e.g. protons and neutrons) + 1 antibaryons: (e.g. 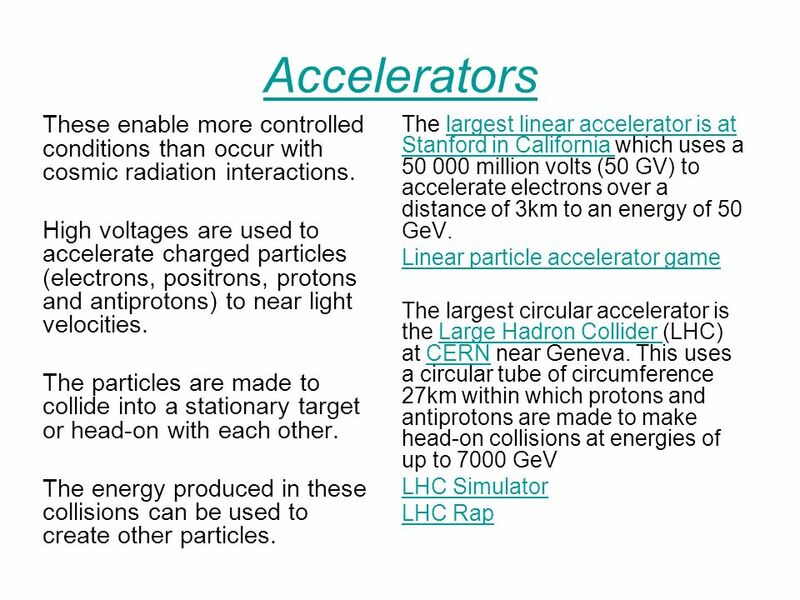 antiproton) - 1 non-baryons (e.g. 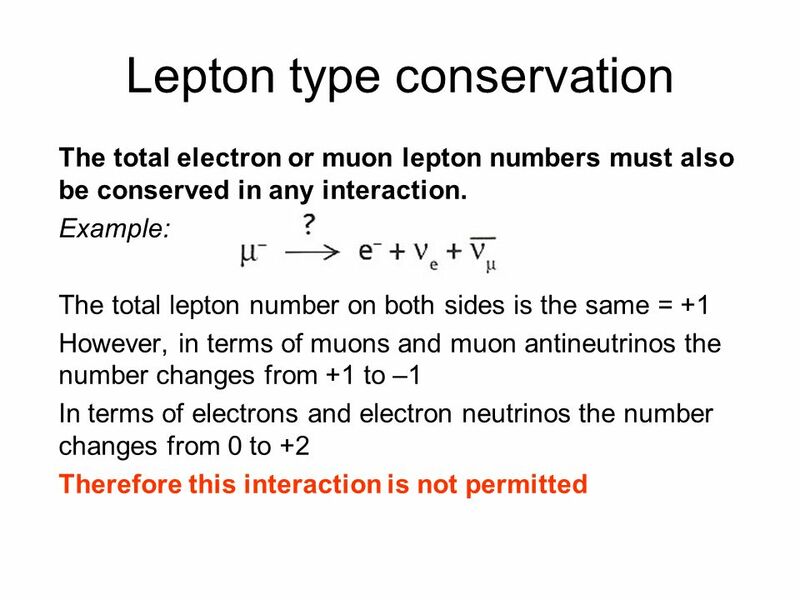 mesons and leptons) Conservation of baryon number In all interactions the total baryon number is conserved. 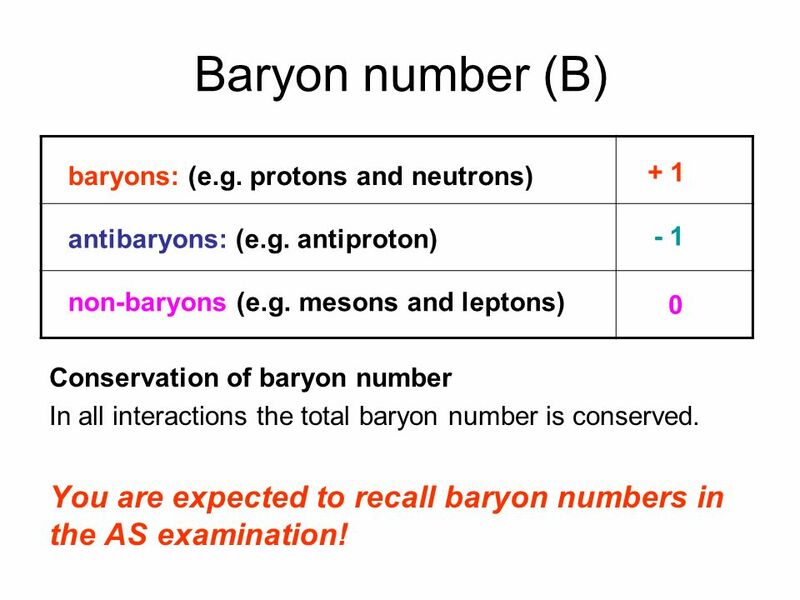 You are expected to recall baryon numbers in the AS examination! 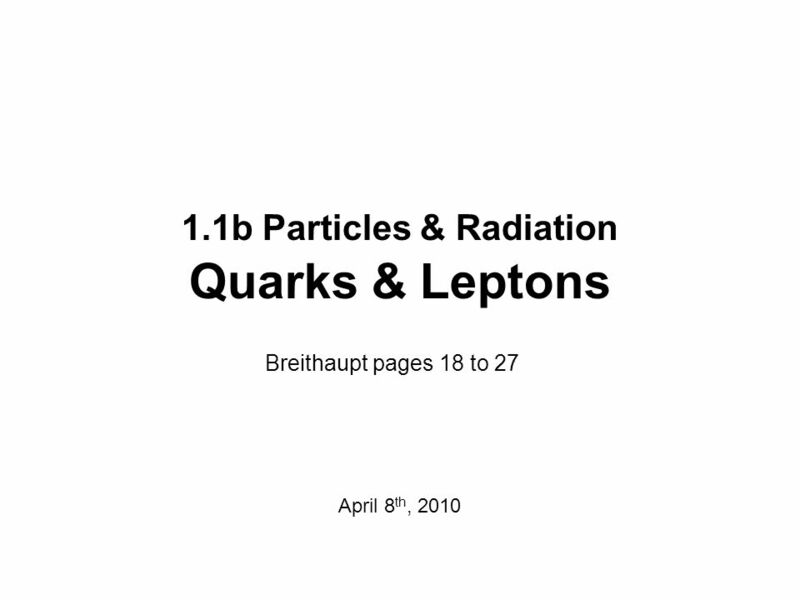 13 Leptons Leptons are believed to be fundamental particles. This means that they do not decay into any other particles except leptons. 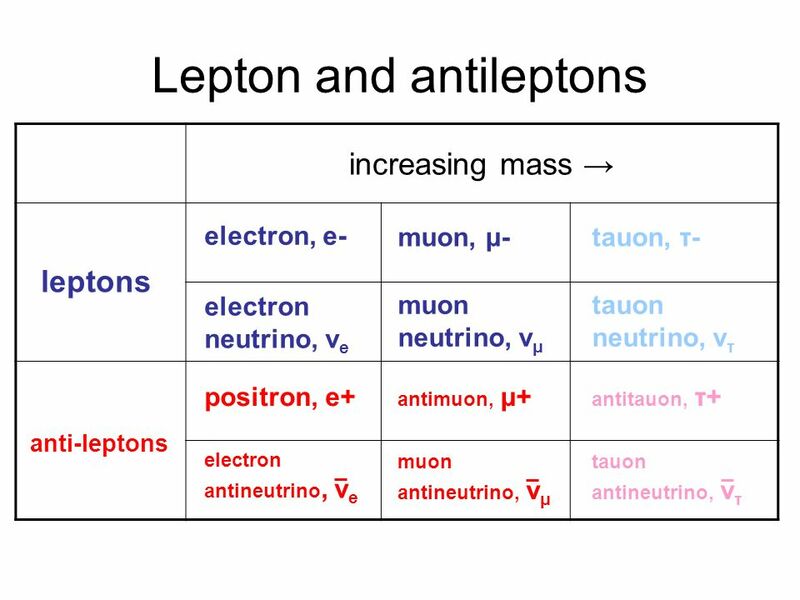 There are three families of leptons and antileptons. 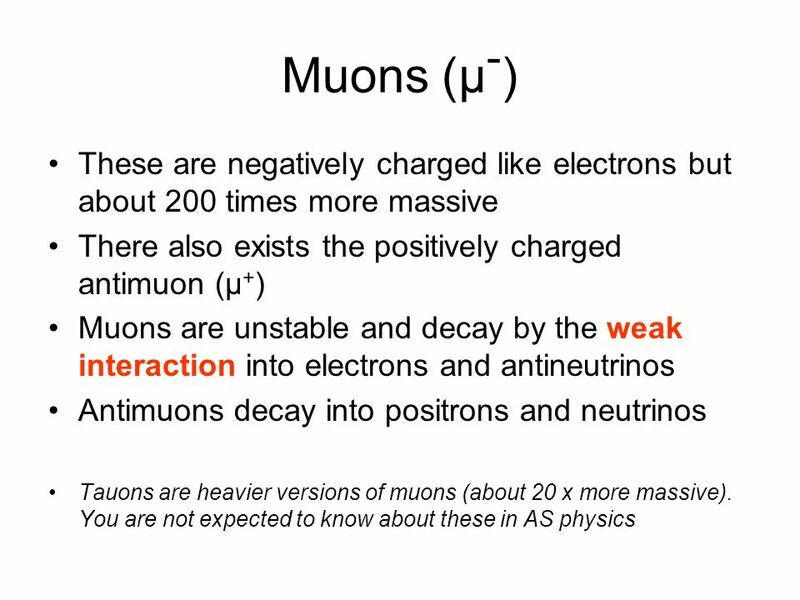 In order of increasing rest mass: electrons and their neutrinos muons and their neutrinos tauons and their neutrinos Only electrons and their neutrinos are stable. 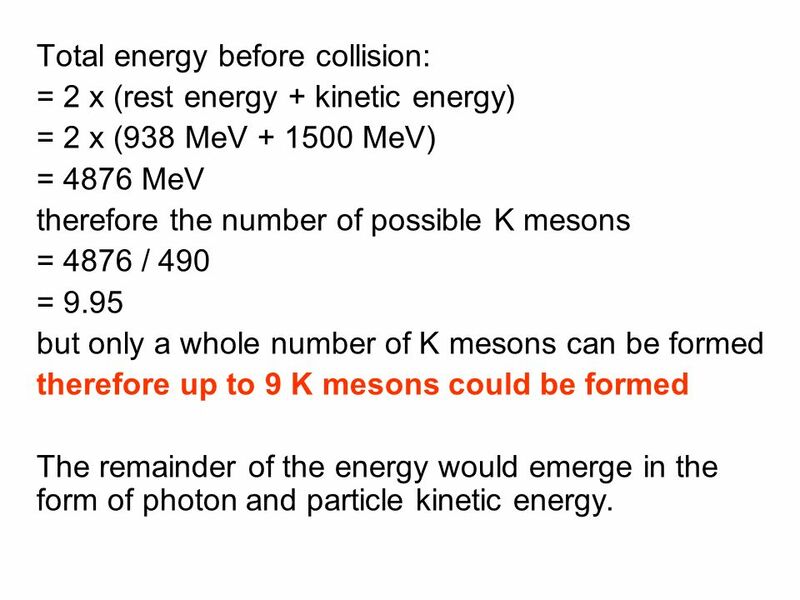 = 2 x (rest energy + kinetic energy) = 2 x (938 MeV MeV) = 4876 MeV therefore the number of possible K mesons = 4876 / 490 = 9.95 but only a whole number of K mesons can be formed therefore up to 9 K mesons could be formed The remainder of the energy would emerge in the form of photon and particle kinetic energy. 28 Can the following interactions occur ? 30 Quarks Baryons and mesons are not fundamental particles of matter (unlike leptons) but are composed of smaller particles called quarks. 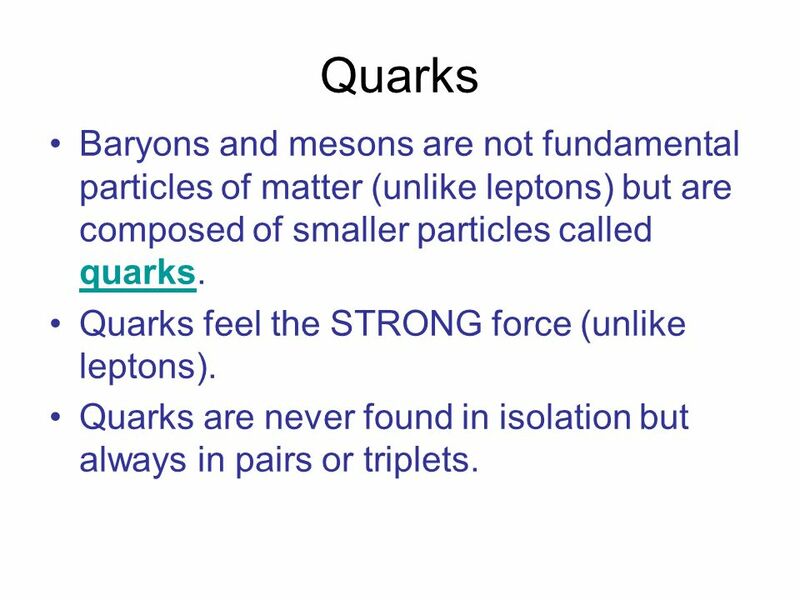 Quarks feel the STRONG force (unlike leptons). Quarks are never found in isolation but always in pairs or triplets. 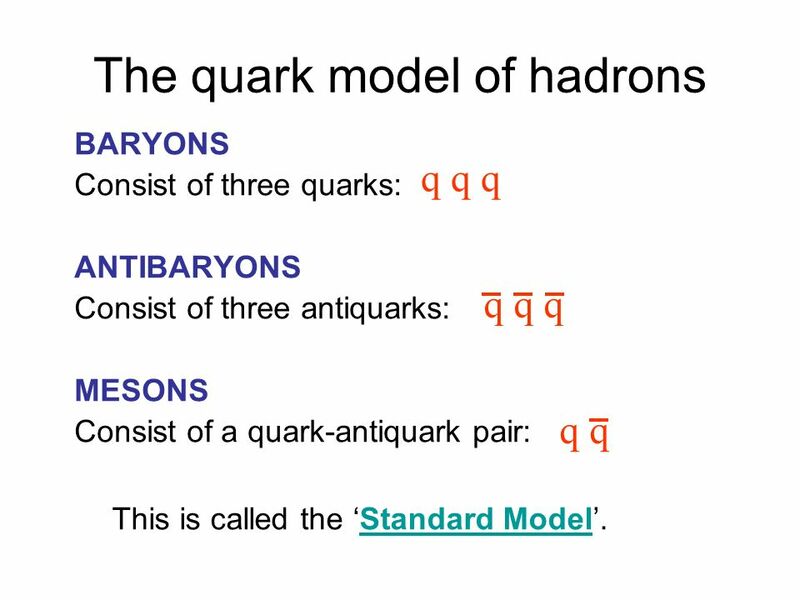 BARYONS Consist of three quarks: ANTIBARYONS Consist of three antiquarks: MESONS Consist of a quark-antiquark pair: q q q q q q q q This is called the ‘Standard Model’. 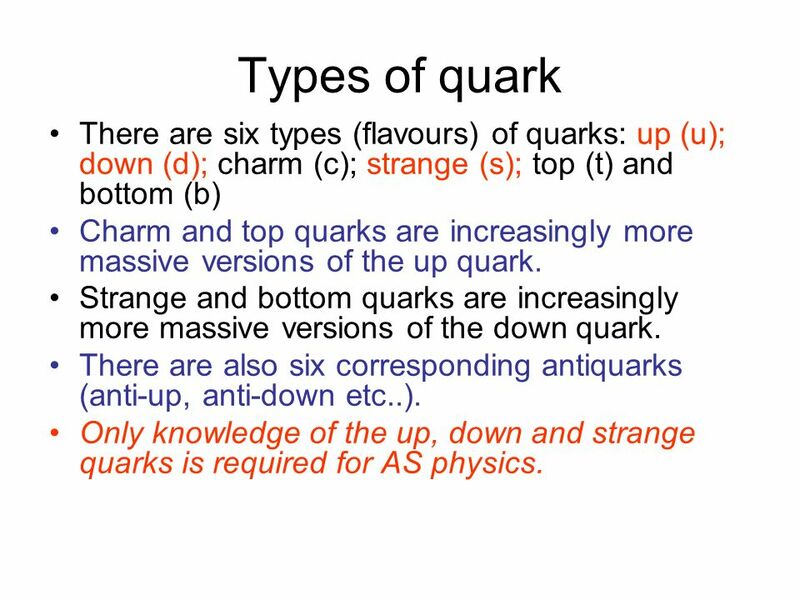 32 Types of quark There are six types (flavours) of quarks: up (u); down (d); charm (c); strange (s); top (t) and bottom (b) Charm and top quarks are increasingly more massive versions of the up quark. Strange and bottom quarks are increasingly more massive versions of the down quark. There are also six corresponding antiquarks (anti-up, anti-down etc..). 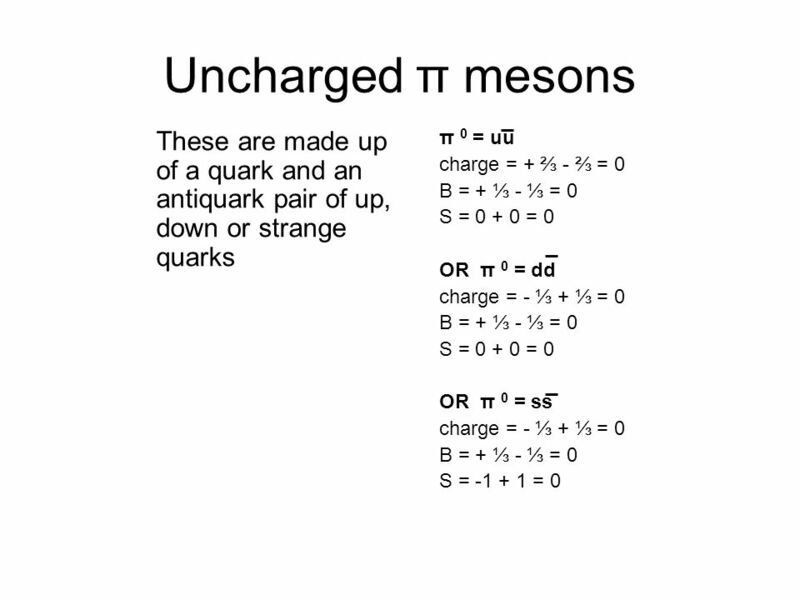 Only knowledge of the up, down and strange quarks is required for AS physics. 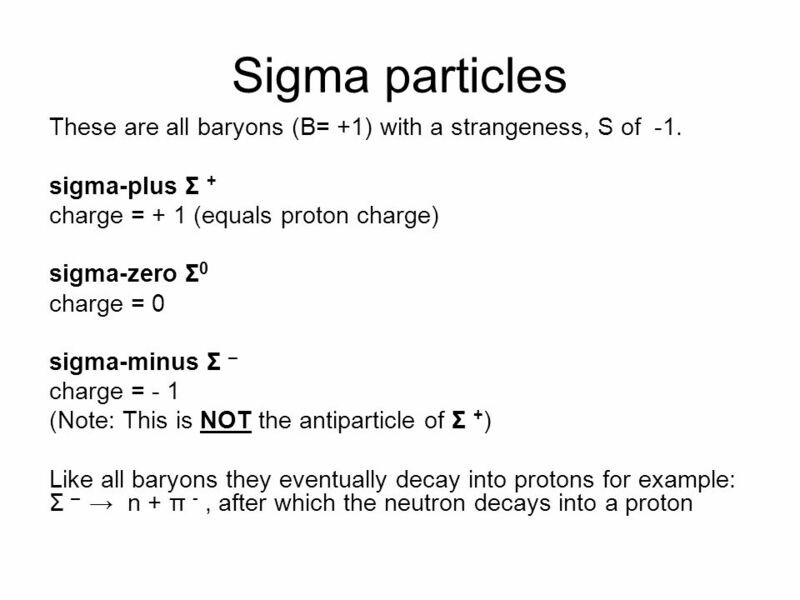 symbol relative mass charge proton = 1 baryon number strangeness up u 1 + ⅔ + ⅓ down d 2 - ⅓ strange s 40 charm c 600 top t 90 000 bottom b 2000 up u 1 + ⅔ + ⅓ down d 2 - ⅓ + ⅓ strange s 40 - ⅓ + ⅓ - 1 charm c ⅔	+ ⅓ top t ⅔	+ ⅓ bottom	b ⅓	+ ⅓ Antiquarks have the same mass but opposite charge, baryon number and strangeness. 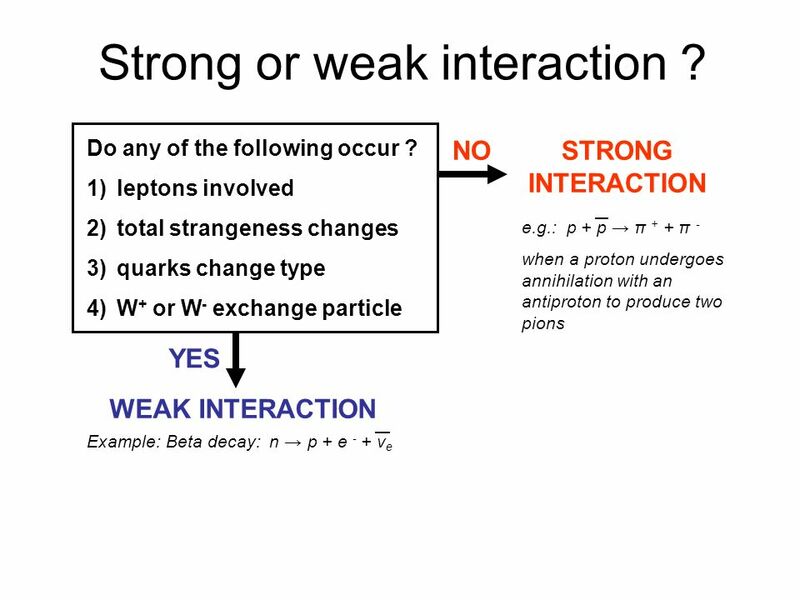 42 Quark interactions Quarks undergo both strong and weak interactions. 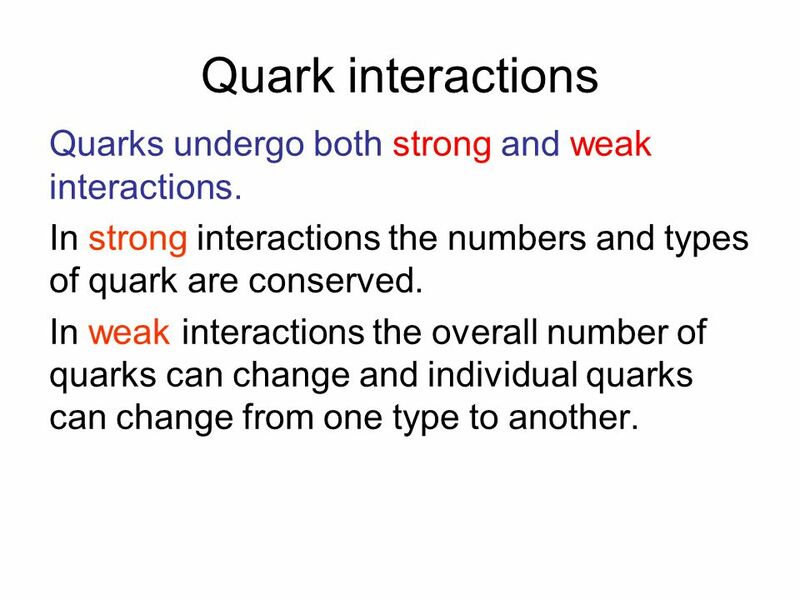 In strong interactions the numbers and types of quark are conserved. 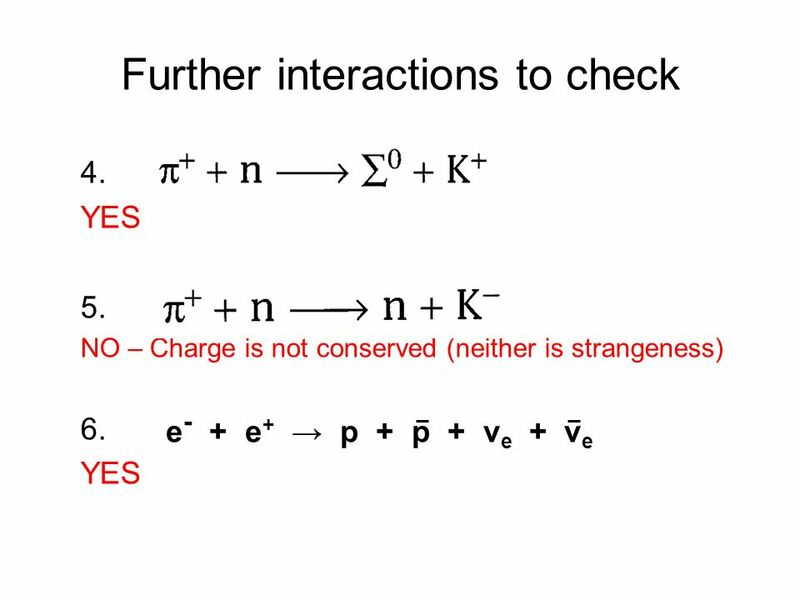 In weak interactions the overall number of quarks can change and individual quarks can change from one type to another. 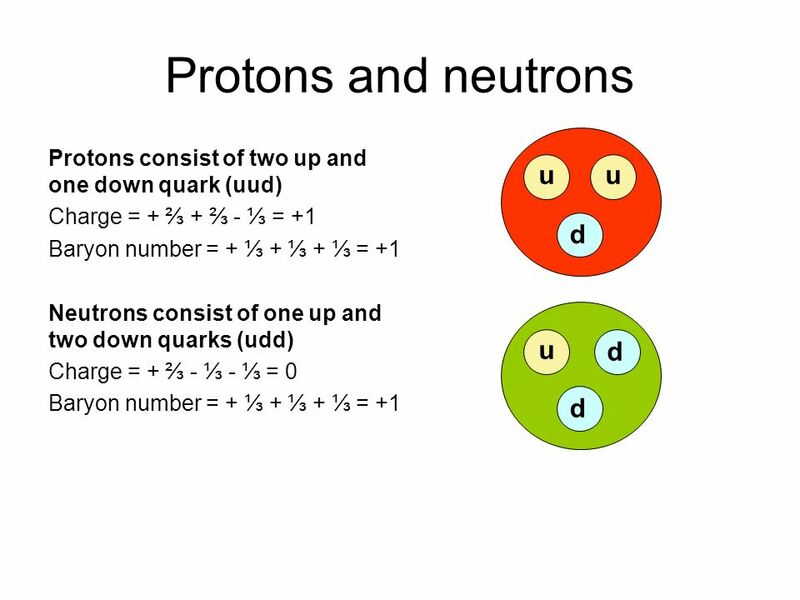 With beta-minus decay a neutron (udd) changes into a proton (uud). This can be represented on a Feynman diagram as a down quark changing into an up quark. β- time u d → u + β- + νe ve W- d Note: An early version of the text book shows, incorrectly, an electron-neutrino. With beta-plus decay a proton (uud) changes into a neutron (udd). u → d + β+ + νe This can be represented on a Feynman diagram as an up quark changing into a down quark. β+ time d ve W+ u Note: An early version of the text book shows, incorrectly, an electron-antineutrino. 46 Strong or weak interaction ? 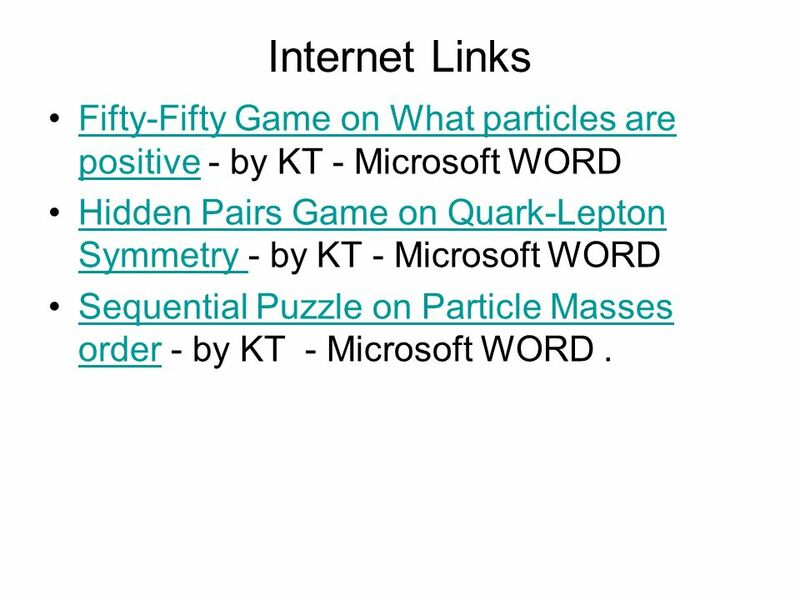 47 Internet Links Fifty-Fifty Game on What particles are positive - by KT - Microsoft WORD Hidden Pairs Game on Quark-Lepton Symmetry - by KT - Microsoft WORD Sequential Puzzle on Particle Masses order - by KT - Microsoft WORD . 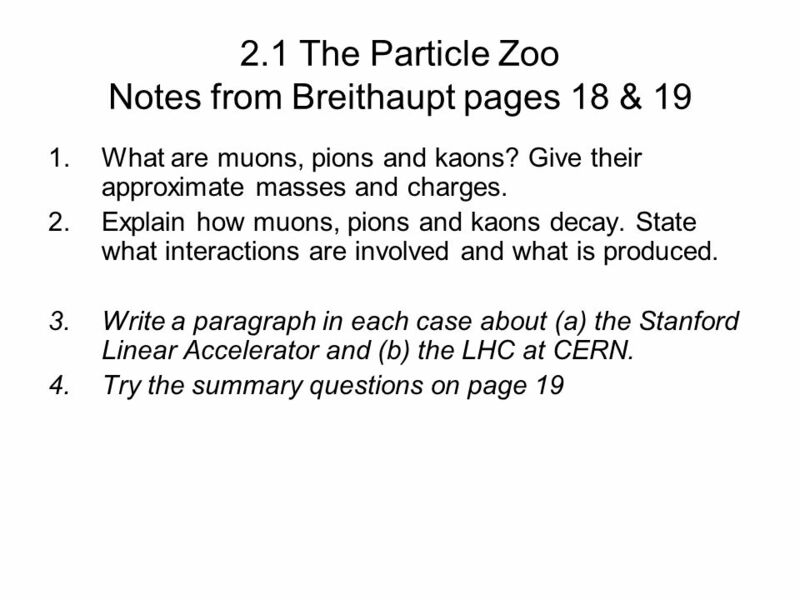 What are muons, pions and kaons? Give their approximate masses and charges. 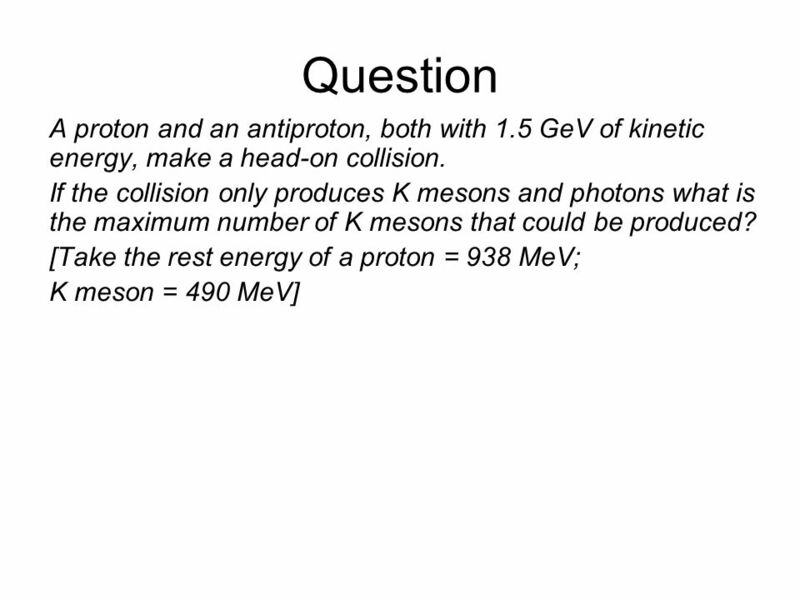 Explain how muons, pions and kaons decay. State what interactions are involved and what is produced. 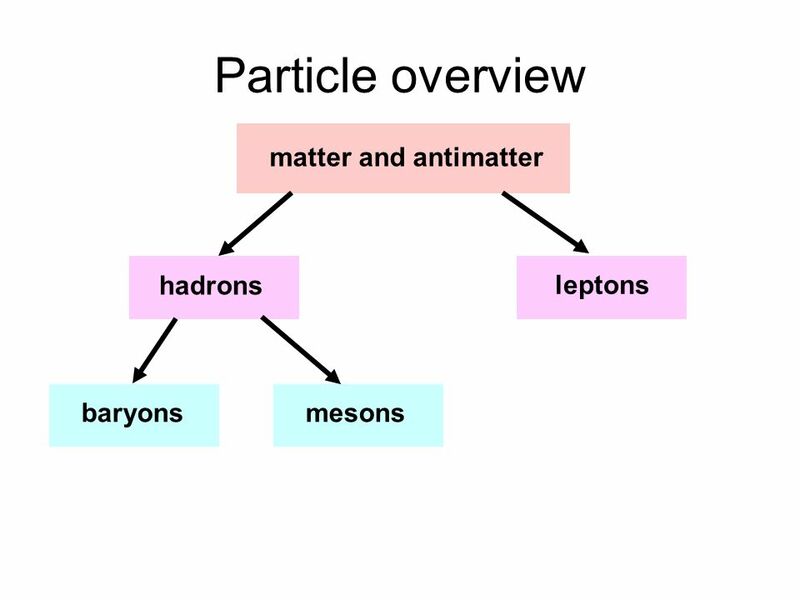 Define what is meant by (a) a hadron; (b) a lepton; (c) a baryon & (d) a meson. Give two examples of each type of particle. How many baryons are stable? Name them. Why is a neutron a baryon? What are the two types of neutrinos? 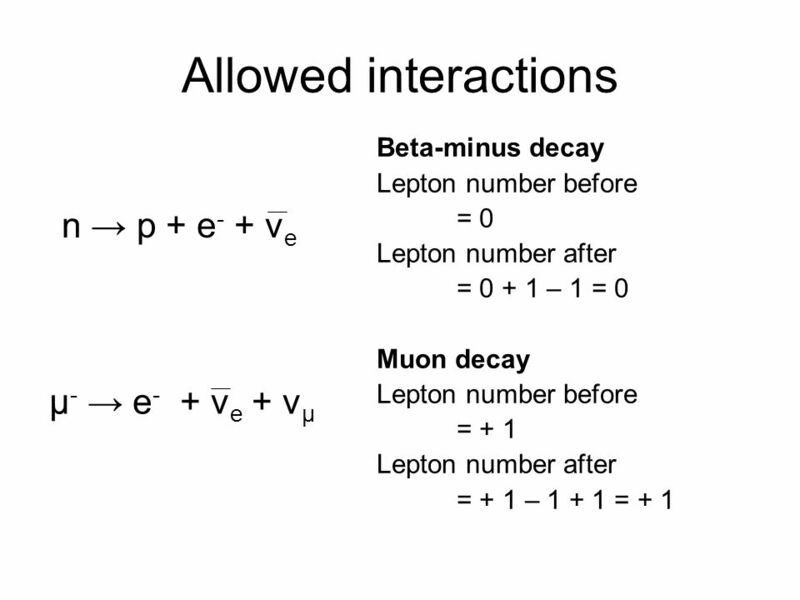 Explain the lepton rules in (a) interactions between leptons and hadrons and (b) muon decay Give and explain an example of a non-allowed interaction where lepton number is conserved. (see the ‘weak puzzle’) Copy table 1 on page 25. 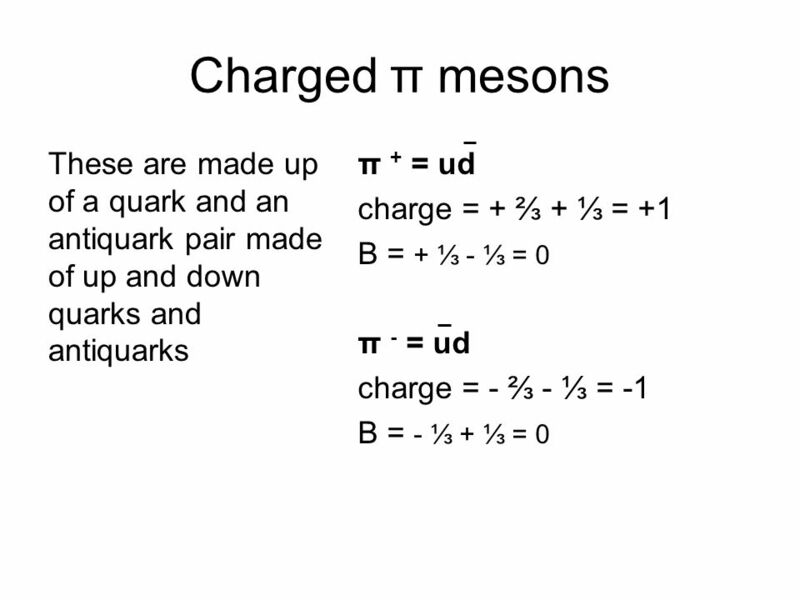 Define baryons, antibaryons and mesons in terms of quark composition. State the quark compositions of protons, neutrons, antiprotons and the three varieties of pion. 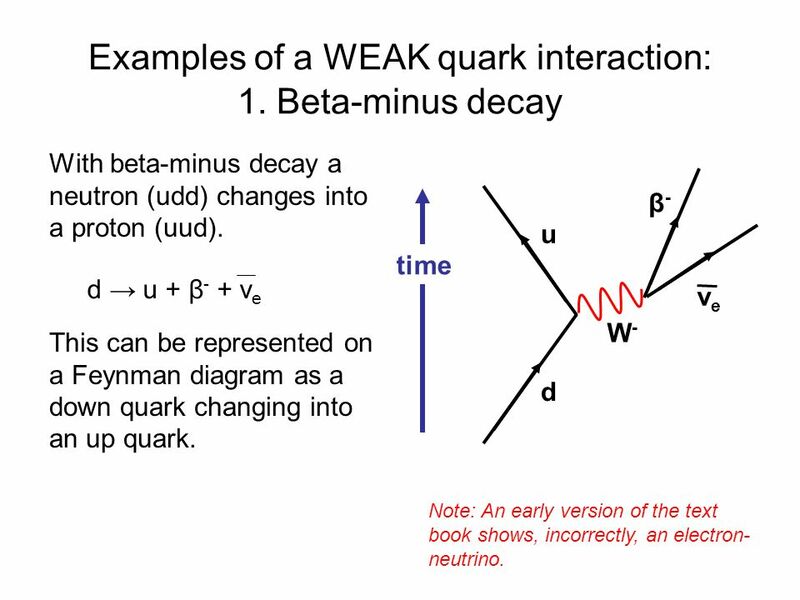 Explain beta-minus and beta-plus decay in terms of quark change. Illustrate with Feynman diagrams. 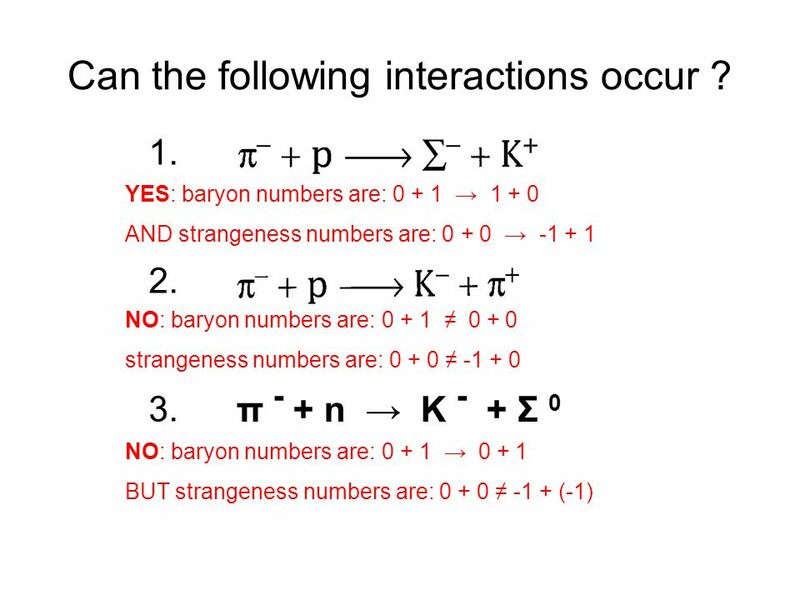 Define what is meant by Baryon number. 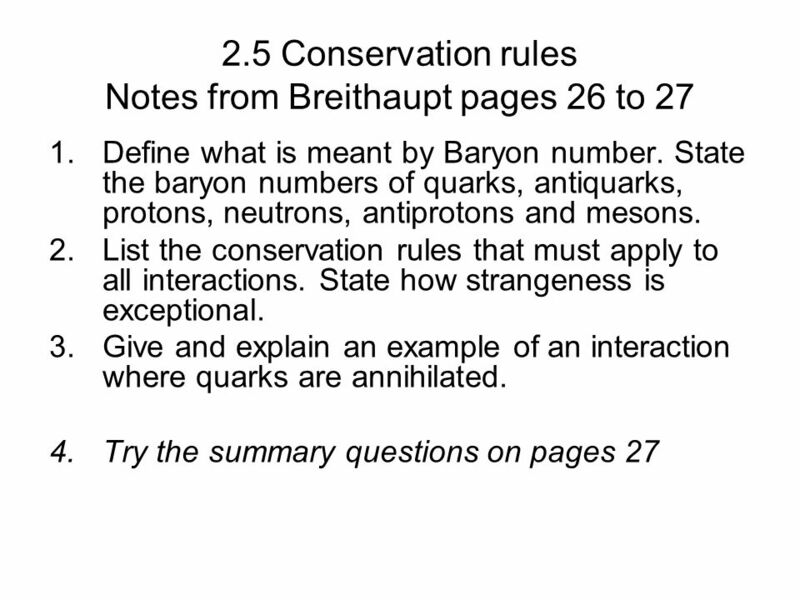 State the baryon numbers of quarks, antiquarks, protons, neutrons, antiprotons and mesons. 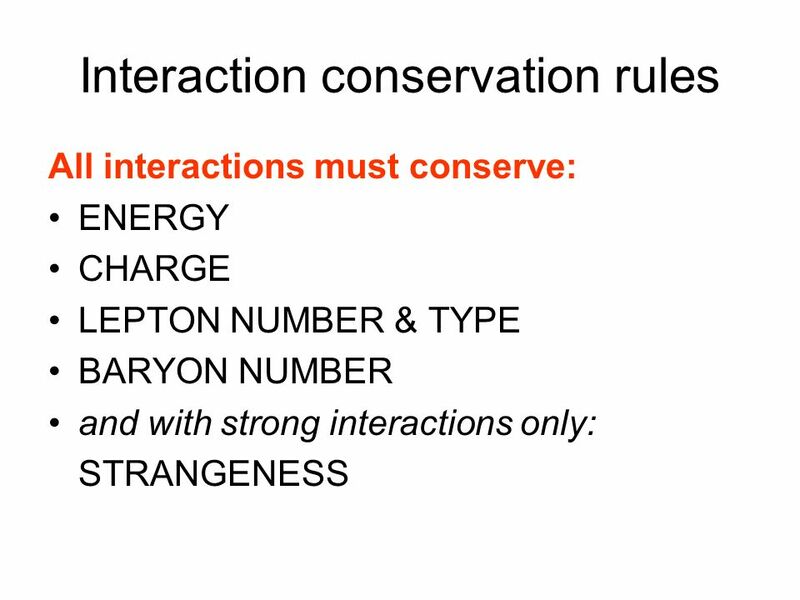 List the conservation rules that must apply to all interactions. State how strangeness is exceptional. 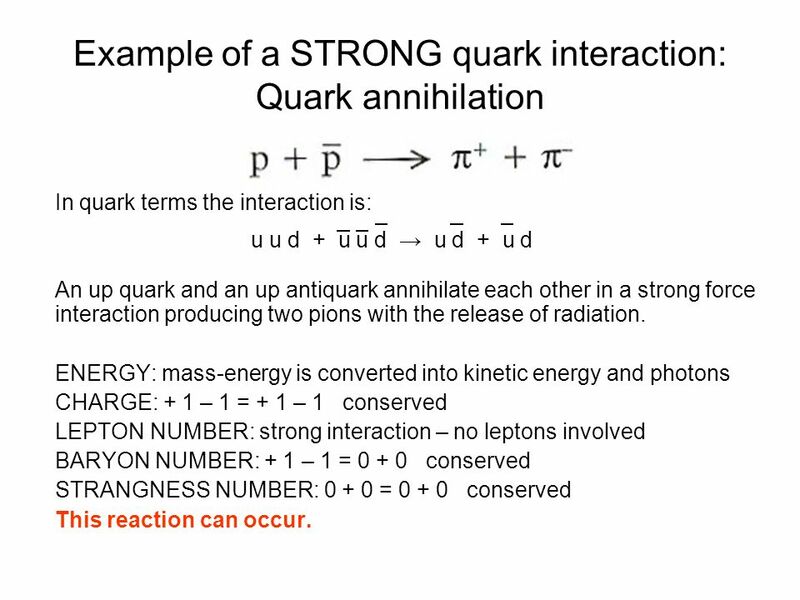 Give and explain an example of an interaction where quarks are annihilated. 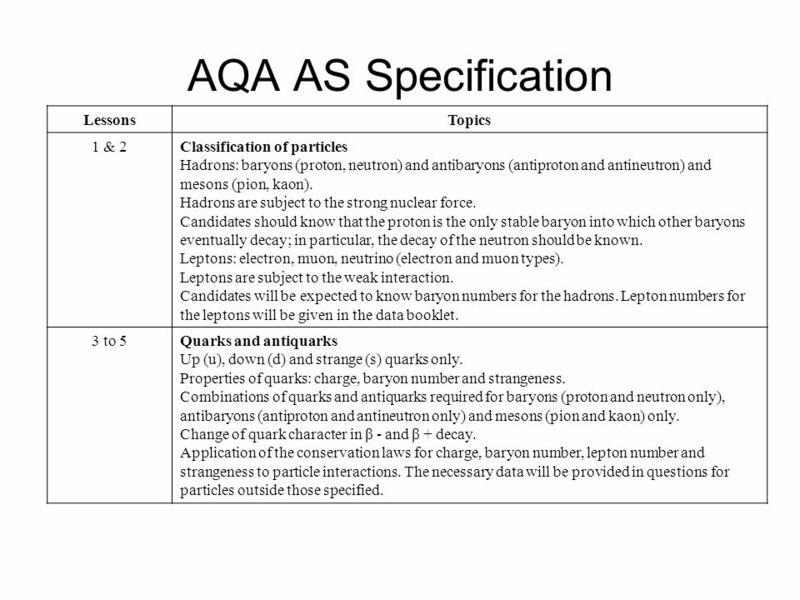 Download ppt "1.1b Particles & Radiation Quarks & Leptons"
Going Smaller than Atoms AQA Syllabus A A Level Physics – Module 2 © T Harrison. The National School. 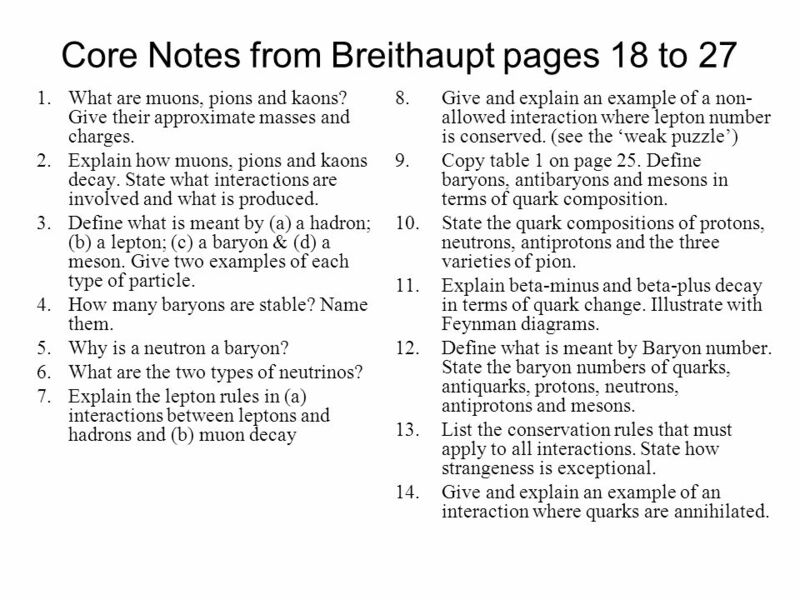 Modern Physics By Neil Bronks Atoms C 12 6 Mass Number Mass Number - Number of protons + Neutrons. Atomic Number Atomic Number - Number of protons In. Garfield Graphics included with kind permission from PAWS Inc. All Rights Reserved. Strange Particles AS level Notes. Particles, Quantum Phenomena and Electricity. 4 Fundamental Forces Gravity Electromagnetic Weak nuclear Strong nuclear  gravitons  photons  W bosons. Charge conservation: is the principle that electric charge can neither be created nor destroyed. The quantity of electric charge, the amount of positive. 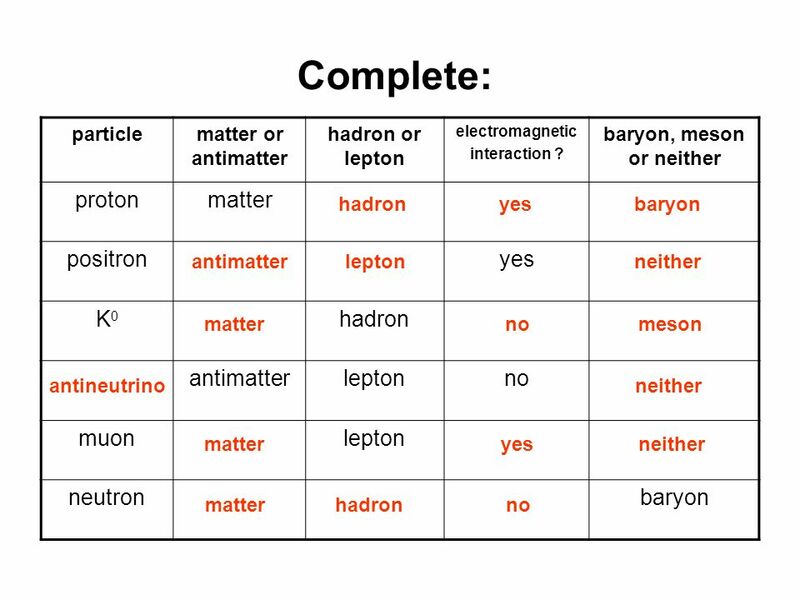 Leptons: There are 6 leptons (and their corresponding anti-leptons). 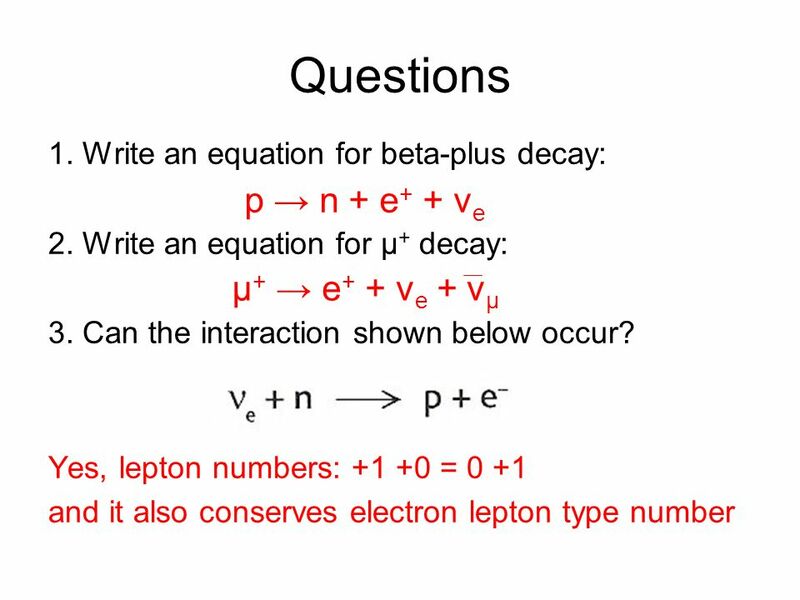 One 1st generation lepton is the electron previously discussed. The electron. Sub-Atomic Particles Another building block of matter?? Richard Lasky – Summer 2010. Option 212: UNIT 2 Elementary Particles Department of Physics and Astronomy SCHEDULE 3-Feb pm Physics LRA Dr Matt Burleigh Intro lecture 7-Feb-05. Charged Particles. Nuclear Physics Charged particles can come from nuclear decay. 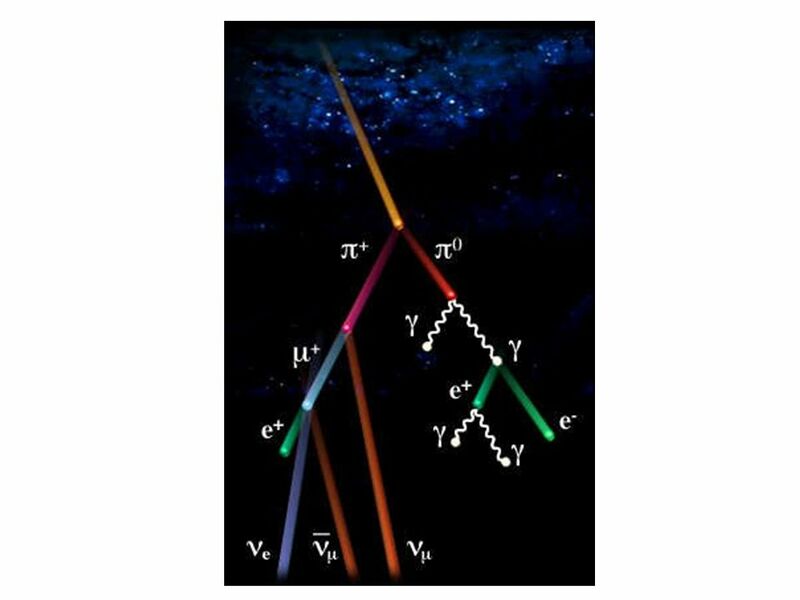 Nuclear physics figures into particle detection. Use terminology from. 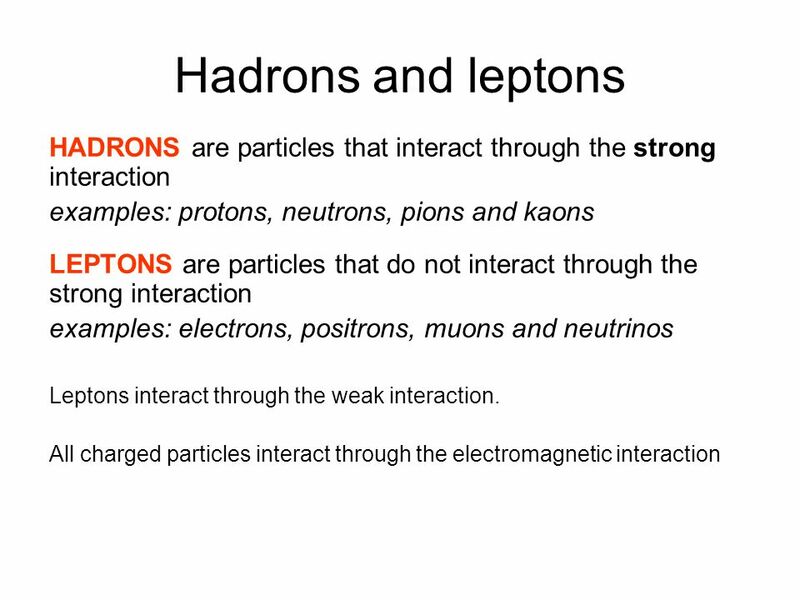 UNIT 2: OUTLINE SYLLABUS: 1st Lecture Introduction Hadrons and Leptons Spin & Anti-Particles The conservation laws: Lepton Number Baryon number Strangeness. 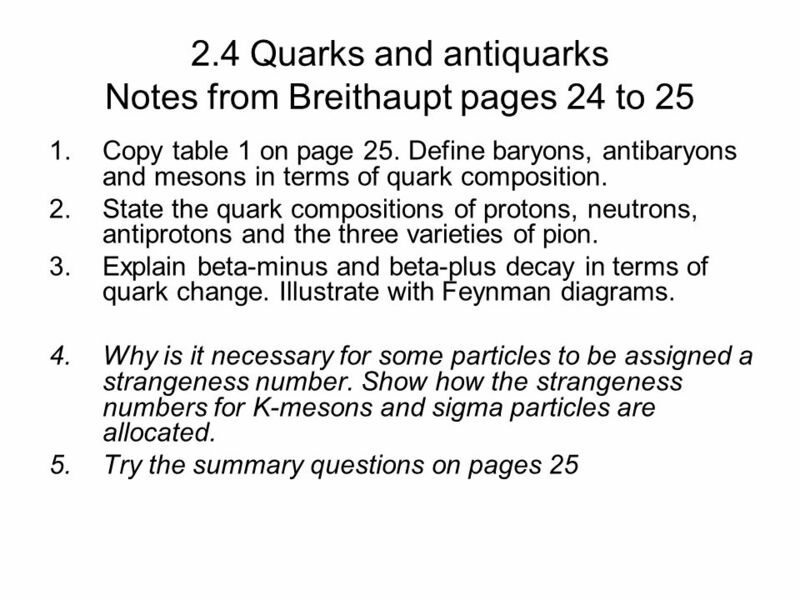 8/5/2002Ulrich Heintz - Quarknet Particle Physics what do we know? Ulrich Heintz Boston University. 5.3.2 Fundamental Particles. (a) explain that since protons and neutrons contain charged constituents called quarks they are, therefore, not fundamental. 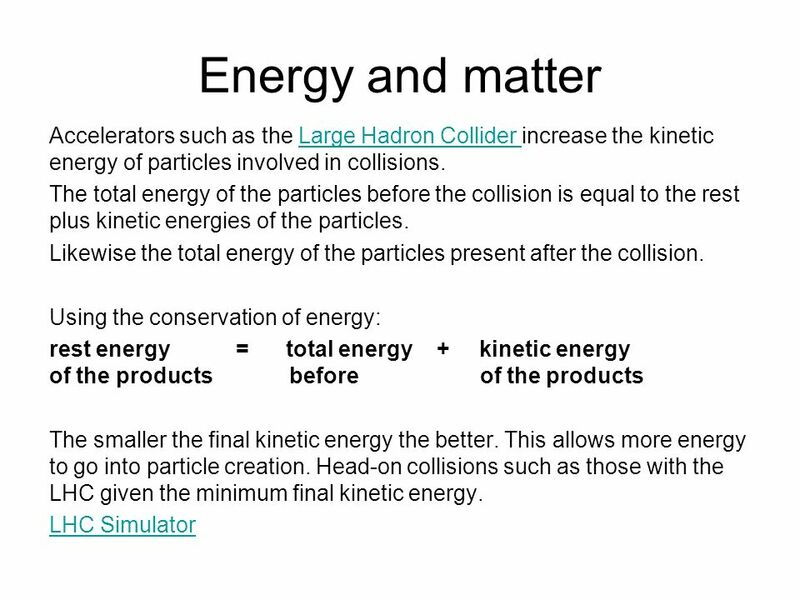 Modern Physics Introduction To examine the fundamental nuclear model To examine nuclear classification To examine nuclear fission and fusion.